Published: Dec. 24, 2011 at 04:10 p.m.
(4:03) (Shotgun) S.Wallace pass short left to P.Hillis to CLV 45 for no gain (B.Ayanbadejo). Published: Nov. 20, 2011 at 04:28 p.m.
(:53) (Shotgun) A.Dalton pass short right intended for A.Caldwell INTERCEPTED by J.Smith at CIN 32. J.Smith to CIN 16 for 16 yards (J.Simpson). 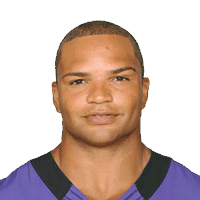 FUMBLES (J.Simpson), recovered by BLT-B.Ayanbadejo at CIN 2. B.Ayanbadejo to CIN 2 for no gain (A.Smith). Published: Nov. 20, 2011 at 03:48 p.m.
An interception, a fumble, a buried referee, and a recovery near the goal line sets the Ravens up for an easy score against the Bengals. Published: Oct. 16, 2011 at 07:50 p.m.
(1:25) A.Foster left tackle to HST 29 for 1 yard (R.Lewis, B.Ayanbadejo).